In and before May of 2011 I was very active in raising pigs for the table. 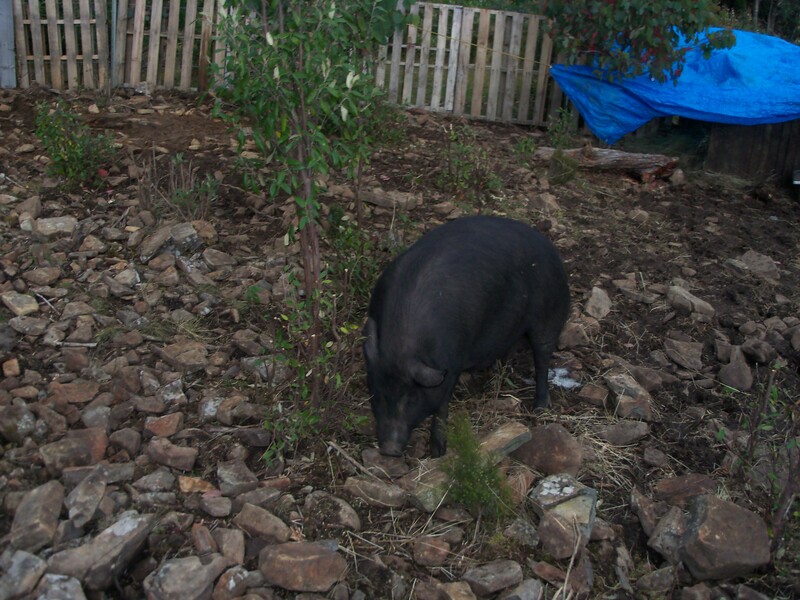 I had two female pigs (called Leia and Beru) and a one male pig (Han). With these I had bred several successful litters. Everything was working out quite well and while they were a bit of an expense and did take some of my time, I was very happy with their progress. In May my pig Leia had just given birth to a litter and Beru was in heat, having recently weened her litter. I had allowed Han to live in the same pen as Beru as the young litter needed a place away from the larger pigs so they could grow to the correct size. Realising that Beru was in heat, and as I didn’t want her to get pregnant so recently after the last litter (as well as I didn’t want her to give birth in winter) I moved her to a different pen late one night. The next morning I came out to feed the pigs. As always I went into the pig pens to check the pigs and give them a bit of a scratch/pat. I fed the two females and the young piglets, then I went to take care of Han. I walked towards him, as he walked to me, and I reached down to give him a scratch behind his ears, next thing I knew was that he head-butted my right calf. I stagged back a step (he was around 200kgs of pig) and wondered what had just happened, and why did he hit me. I realised that he did have tusks so I looked at my calf, and while I was wearing large black gumboots, I could see no damage which was a relief. It was then that Han took a step back then came at me again. I had to react in a slit second so before he reached me I punched him in the head (tip for everyone… do NOT punch a pig in the head. They have a massive, thick skull and it really hurt my hand) which stopped him in his tracks and he then walked off with a loud grunt. My calf hurt a little, yet it wasn’t bad, so I put his food in his trough and proceeded to climb over the fence… all the while being thankful that we did not allow the kids into the pig pen. Once over the fence I was about to start walking to the house. I took a step and heard a squelch sound from inside my boot as my foot hit the ground. I rolled my eyes, realising what had occurred and I looked down at my boot. On the side of the boot I could see a fast moving trail of blood coming from a previously unseen slit in the side of my boot. I walked back to the house and asked Kitty to help be take the boot off, which had by now almost totally filled with blood. After a brief check we realised that I injury was quite severe. Kitty and realised that I would need to go to the hospital, yet I did not want to go inside an ambulance. I reasoned that it would be faster to drive there than to wait for an ambulance to come and take me, Kitty wrapped up the wound and we all piled into the van. 45 minutes later we pulled up to the hospital and I climbed out of the car. Kitty had to park the car nearby, but would be back shortly. I limped into Emergency and told the registration desk that I had been gored by a pig. They took my name and details and asked me to sit down. I sat in the waiting room for 5 minutes before someone noticed a rapidly expanding pool of blood on the floor, centred on me. It was quite disgusting and a little embarrassing to be making such a large mess. As they rushed a wheelchair to me to take me to the treatment room I apologised to the cleaner who appeared to mop up the mess. She told me it was OK and that she had cleaned up worse. I was put onto a bed in the treatment room and a doctor began checking my injury. It was at this time that my family arrived and they were shocked to see my condition. Apparently I was looking quite ashen faced and they were concerned that I was fading. I tried to keep them calm by making jokes and keeping light heartened. The doctor advised us that the injury had cut a vein and he estimated that I would need a blood transfusion and maybe stay the night. I told him that I would prefer not to have a transfusion or stay the night (I really don’t like staying in hospitals at night. Too many horror movies as a child), yet I would follow his direction. I waited for ½ an hour for the surgeon to arrive and during this time, while they gave me a tetanus vaccination and did some cleaning of the wound. It was around then that I almost passed out. I suspect that it was loss of blood, but I am not sure. Eventually the surgeon came to visit me. He explained that he was from Iraq and had experience in treating trauma such as bullet wounds and this was not going to be too difficult for him. After several shots to numb the area, and many visits from other staff members who were curious as to what a pig goring looked like, the doctor started to clean out the wound and repair the damage. Despite the pain shots, this was a very painful experience and took a lot of my will not to move or flinch while he worked. After a while the doctor finished and despite his warnings of probable infection, my leg healed without complications. I expect that the doctor’s Iraq experience is the reason my leg healed so well. I was house bound for several weeks, although I did try to go back to work after the first week, only to realise I wasn’t ready. When my leg healed I had made the decision to get rid of Han. In the few days before I made the decision, Han spent significant time attempting to break out of his fenced enclosure. Kitty and I were concerned that should he escape, now that he had attacked me, he might attack the children or one of our neighbours. I needed to take care of him. 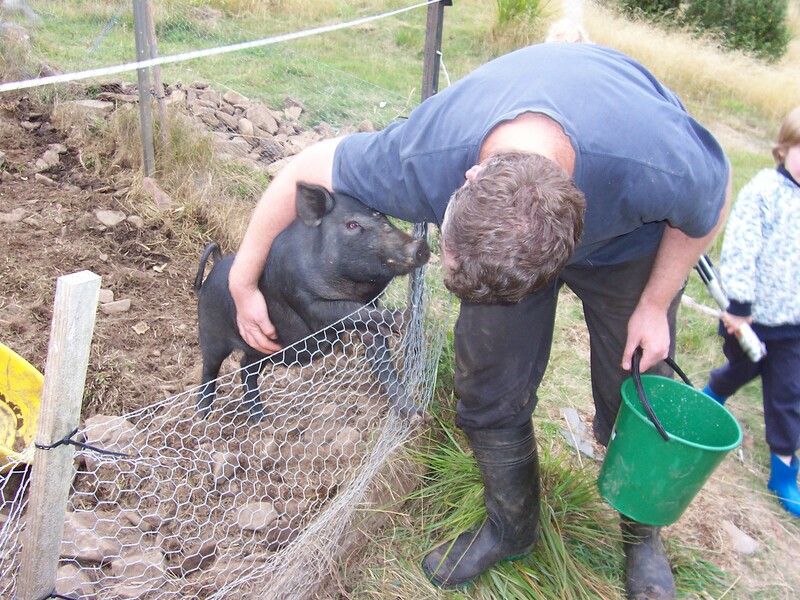 This is me giving one of the young pigs a cuddle. On a cool winter morning I went and said goodbye to Han. I had decided that we would use him for meat, so I went and put him down in his enclosure. It was then that I realised I could not drag or carry a 200kg boar to my butchering area. Kitty and I spent a while loading him onto a wheelbarrow and, 15 minutes later, got him to the butchering area. I tied his hocks to the rope and attempted to hang him from the roof. This was impossible, which I realised after I started this. I weigh around 120kg… I could not raise a pig almost twice me weight. Regardless of these issues, I eventually finished butchering Han and cleaned up the mess. I was sad to see him go, and I did not blame him for attacking me, yet it was required. His attempts to break out showed that he had gotten out of control and I decided that my pig breeding days were over. At least for now.